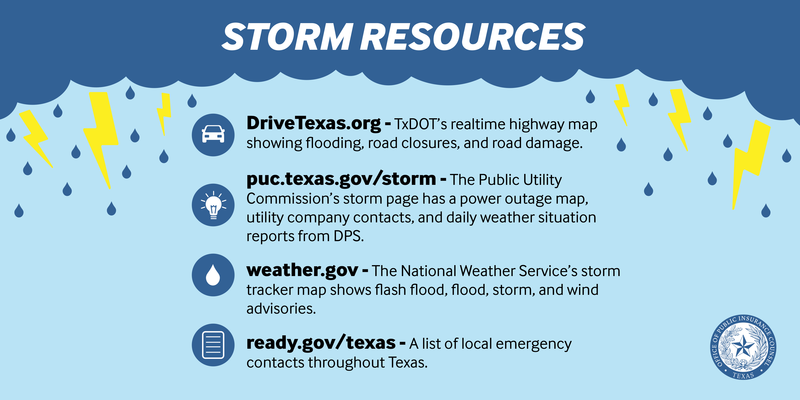 DriveTexas.org – TxDOT’s realtime highway map showing flooding, road closures, construction, accidents, traffic, and road damage. puc.texas.gov/storm – The Public Utility Commission’s storm page has a power outage map, utility company contacts, weather updates from the Electric Reliability Council of Texas and daily weather situation reports from the Department of Public Safety. weather.gov – The National Weather Service’s storm tracker map shows flash flood, flood, storm, and wind advisories. ready.gov/texas – A list of local emergency contacts throughout Texas, including, Texas Division of Emergency Management (TDEM), local county info, and Texas State Citizen Corps. *⃣Visit our Flood Insurance page for more storm-related info and tips.